THE BIGGEST SUPER MEGAFEST COMIC CON IN HISTORY - 75,000- square feet of Spectacular! The New England Super Megafest Spring Spectacular is here! Hollywood & Comic Book fun comes back to New England this Spring! 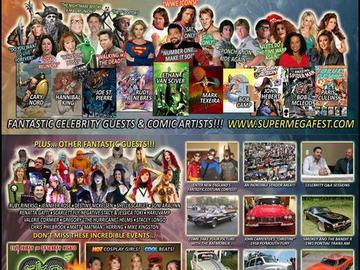 Comics, Movies, Super Heroes, Music, Wrestling and Intergalactic Fun come together in Marlborough at the Super Megafest, New England’s premiere Comic Celebrity Pop Culture Fan Fest! JONATHAN FRAKES – Commander Riker of Star Trek! SYLVESTER McCOY - Dr Who and Raddagast of the Hobbit series! JOSH MCDERMITT (SAT & SUN ONLY) - Eugene of WALKING DEAD! CHRIS SARANDON - Princess Bride, Fright Night and the voice of Jack Skellington from Nightmare Before Christmas! KEN PAGE (FRIDAY & SATURDAY ONLY) - voice of Oogie Boogie from Nightmare Before Christmas! ERIK ESTRADA and LARRY WILCOX - CHiPs Ponch and Jon! HELEN SLATER (FRIDAY & SATURDAY ONLY) - of Supergirl fame! RODDY PIPER - Wrestling Superstar! BRET HART (SATURDAY ONLY) - Wrestling Superstar! CHRIS JERICHO (SUNDAY ONLY) - WWE Superstar! BARRY BOSTWICK - Brad of Rocky Horror Picture Show! PATRICIA QUINN is best known for her role as Magenta in The Rocky Horror Picture Show! KATHERINE HELMOND of SOAP, Who's the Boss and EVERYONE LOVES RAYMOND! SANDAHL BERGMEN - who starred as Valeria in Conan the Barbarian! RAE DAWN CHONG - starred in Commando and Quest for Fire! Plus other guests to be announced! CARY NORD - Conan, Dare Devil! BOB CAMP - Co-Creator of Ren and Stimpy! MARK TEXEIRA – know for Marvel and DC Comics plus much more! ETHAN VAN SCIVER - Doing custom super hero sketches throughout the weekend! JOE ST. PIERRE - artist of Spiderman, Green Lantern, Batman and a vast array of other heroes! JOHN HEBERT- X-Men Adventures, Punisher, Deathlok and current Captain Action artist! Other attractions include an amazing Costume Contest (including a children's category), stunning Movie Cars, mischievous Pirate madness, personal 3D Scan-to-Figure souvenir and much more! After hours, enjoy a multitude of shadowcast movie performances and parties, including the CosCLUB Dance Party, ensuring the event has something for all ages!